It’s a box full of smartphone-compatible magic tricks! Includes everything you need to be a digital wizard! Magic might be hundreds of years old, but that doesn’t mean it’s staler than a bag full of reduced supermarket doughnuts. This Marvin’s i-Magic kit pulls the rabbit out of the hat… and plonks it firmly in the 21st century! This kit contains everything you need to pull off 150 insanely interactive illusions, all of which revolve around technology. All you need to do is download the free iOS and Android app and then use it with the goodies in this box to master some technologically tailored tricks, 3D illusions, magic stunts, and amazing mind reading! With this kit you can master and mystify with tricks like the 3D card, the magic fly, x-ray vision, the dis-app-ear, the magic mind reader, camera card, and much more! 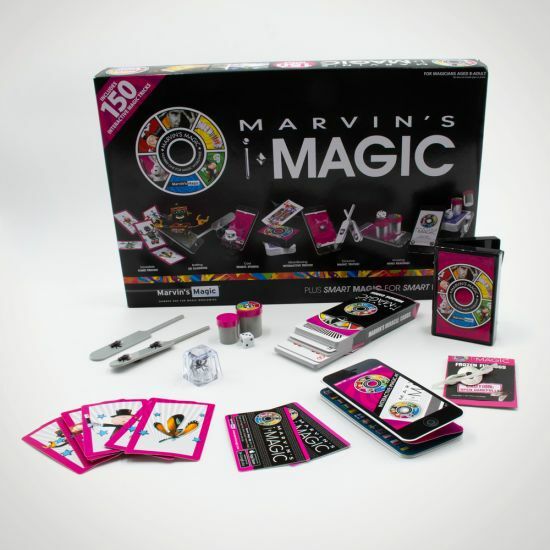 So, if you’re ready to open your imagicnation and spellbind your friends and family, order your Marvin’s i-Magic interactive magic set today!